Brand Knew is a new bi-monthly podcast featuring interviews with marketing leaders of major national brands. Hosted by Austin Moorhead, the podcast will dive into how consumers are changing and what brand leaders are doing about it. Survata is proud to be the initial sponsor - check out their second episode below and be sure to subscribe for future episodes with marketing thought leaders. In 2017, Lyft expanded coverage in the United States from 54% of the population to 95% of the population. They also added their first international market, Canada. Along the way, the brand was updated. The pink mustaches are gone, but the friendliness is still there. Even with this growth, only 0.4% of miles driven in the US are ride-sharing miles, so there's still plenty of open road ahead. 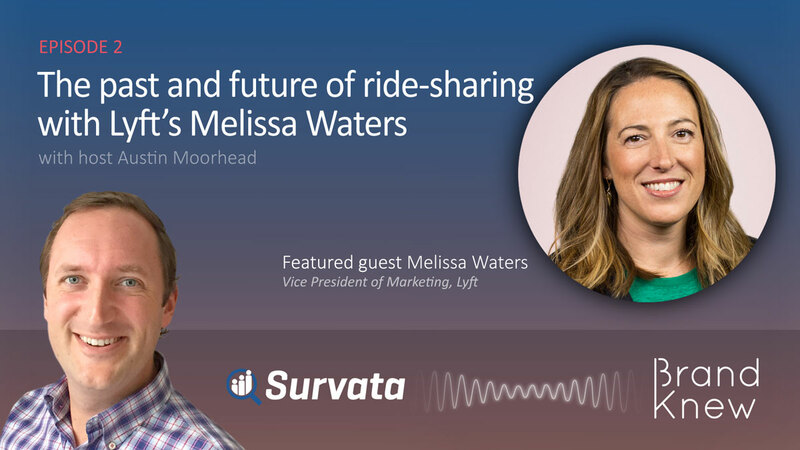 On this episode of Brand Knew, listen to Melissa Waters, Lyft's VP of Marketing, discuss how the brand has evolved with the changing ride-sharing market, and what’s going to become of all those those drivers. Our core brand opportunity is to ensure that we continue to take care of our drivers. What we found is that by taking care of drivers they took care of passengers. So this great flywheel happens: we take care of drivers, they take care of passengers, they provide a great experience, and then passengers say, "Wow, I loved my driver." Technically we manage two audiences, but really we are one brand. We think about our brand in the intersection of the ride experience: two people getting into a car together. In a far future vehicle we believe it’s going to be a “car-like object” with multiple people in it, and you can imagine all kinds of situations in which you would need a steward inside that vehicle. You might need to load strollers, assist elderly people or somebody in a wheelchair. A certain amount of road miles will be driven by self-driving vehicles, but others will not be, such as highly dense traffic areas or outside of normal use cases. You’ll need drivers. Then very far afield when the majority of miles are self-driven, there’s still a role for people in vehicles. We think about those vehicles as potentially "the bar car," "the nail salon on wheels," all manner of different innovations.